Bath’s Cole Parlapiano rounds third base as Elida’s Noah Adcock throws to first base during Tuesday’s gameg at Elida. 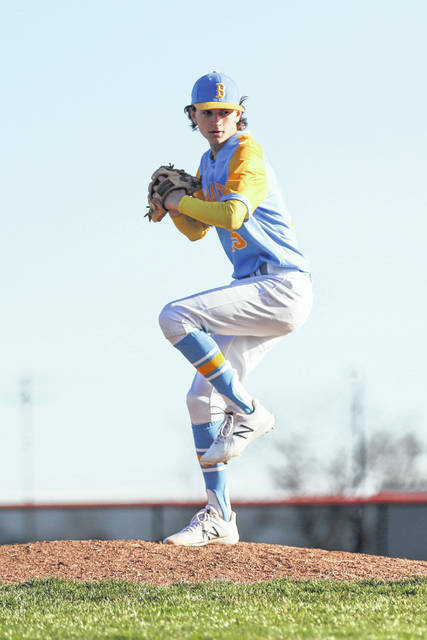 Elida’s TJ Whipple throws to first during Tuesday’s home game against Bath. Luke Burger pitches for Elida during Tuesday’s home game against Bath. Noah Adcock of Elida goes to the air for a line drive from a Bath batter on Tuesday evening at Elida. Austin Sakemiller pitches for Bath during Tuesday game at Elida. ELIDA — When the hits start coming, things tend to fall into place a lot easier. 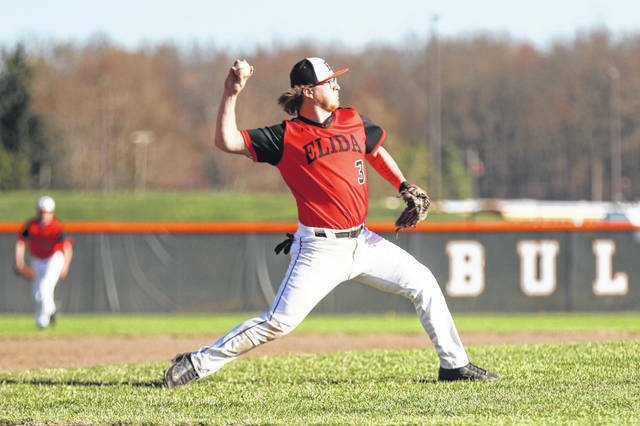 In the last several baseball games, the Elida bats have started to come alive. 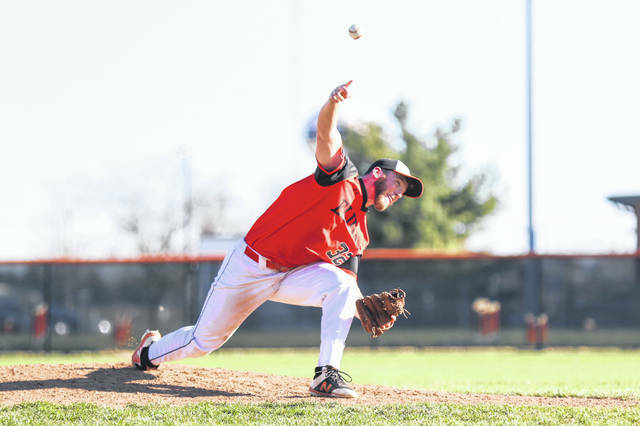 Elida showed patience at the plate in Tuesday’s 7-5 Western Buckeye League win over crosstown-rival Bath at Ed Sandy Field. Elida had seven base hits to go along with a total of eight walks dished out by Bath pitching. 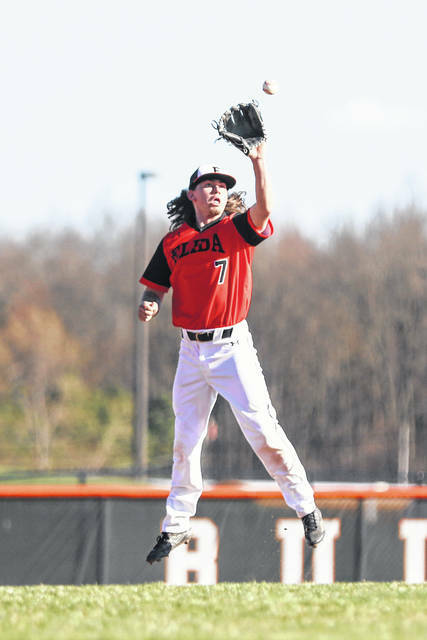 Elida’s resurgence at the plate has now resulted in four consecutive wins. Elida improves to 8-3 overall and 1-2 in the WBL. Bath slips to 5-3 and 2-1. Senior Noah Adcock was one of those Elida players who contributed at the plate against Bath. Adcock was 2 for 4 with a double. Adcock also came in from his shortstop position to take over pitching duties for starter Luke Burger in the top of the third. Adcock worked the next five innings to close out the game for the Bulldogs. He gave up one run on two hits, while striking out six, walking three and hitting two batters. Adcock threw 71 pitches. In his two innings of work, Burger was tabbed for four runs on four hits, while striking out two and walking two. He threw 49 pitches. Burger had a good night with the bat, however, going 2 for 2, including an RBI triple in Elida’s four-run first inning. Elida tallied four runs on just two hits in the home half of the first, as Bath starting pitcher Logan Davis struggled with his control. Davis lasted just one inning, before giving way to Austin Sakemiller. Davis was tabbed for the four runs, while striking out one and walking six. He tossed 48 pitches in his lone inning of work. Sakemiller worked one inning, before being lifted for Lex Boedicker, who came over from his first base position. 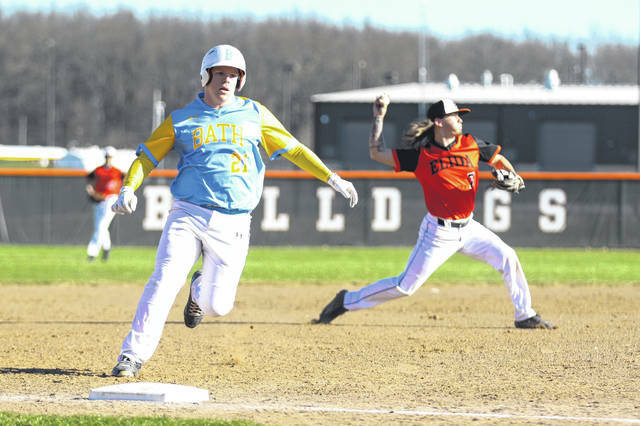 After Elida took the 4-0 lead in the bottom of the first, Bath battled back and scored four runs of its own in the top of the second. Gage Iiames (1 for 3), Boedicker and Caleb Buerger (1 for 4) each had RBI singles for Bath in the second inning. The Bulldogs added two runs in their half of the second to take a 6-4 lead. Brayden Lybarger hit a sacrifice fly to right field that scored a run for Elida. The other run was the result of a passed ball. Bath added a run in the fourth on an RBI single by Cole Parlapiano to cut the Elida lead to 6-5. However, Elida added an insurance run in the sixth on a sacrifice fly by Jordan Davis, that drove in Adcock. This entry was tagged bath, Elida. Bookmark the permalink.